Traditional flood geology theory interprets much or all of the Phanerozoic part of the geologic column as formed during the one year of the biblical flood. Some geological and paleontological data are, in my opinion, difficult to explain in this theory. Wholistic geology endeavors to explain more of the earth science data while remaining true to a literal understanding of biblical creation and a global flood. In this view, geological processes such as erosion and sedimentation begin soon after creation or the entrance of sin, and continue for several thousand years. This time interval includes a literal global flood as described in Genesis, but this event did not produce as much of the Phanerozoic record as in traditional flood geology theory. After the rise of Darwinism in the mid 19th century, George McCready Price was a prominent pioneer in developing a flood theory of geology. In his theory the flood explained all geological phenomena. He rejected glaciation and the presumed stratigraphic order of the fossils. Price was convinced that this evolutionary sequence of fossils was an unsubstantiated device of the evolutionists to support their theory. Whitcomb & Morris’s book The Genesis Flood (1961) presented much of Price’s flood theory in a way that caught the attention of a significant portion of the Christian world and brought flood geology into prominence (Numbers 1992, 1999). Harold Clark followed closely in Price’s footsteps for a time, but Clark spent time in field study and recognized weaknesses in Price’s concepts. Clark decided there was indeed a time of more intense glaciation in the Pleistocene, and the fossils really do occur in a predictable sequence in the fossil record. In order to explain how this sequence could be produced by a global flood he proposed his ecological zonation theory (Clark 1946). According to this theory, all basic types of created animals and plantswere alive at the beginning of the flood, and they were killed and buried in a sequence determined by the ecological zone in which they lived. As the flood waters rose, low elevation ecological zones were destroyed first, and successive higher elevation zones were affected in turn. This has become the standard explanation for many believers in a literal flood. As we look more closely at the details of the geologic record it becomes more difficult to reconcile the evidence with Clark’s theory. Not only the sequence of fossils, but current scientific interpretations of many geological phenomena also are a challenge to this theory. Examples include features at many levels in the geologic column that each take time to develop, such as reefs, fossil hard grounds (marine sediments that appear to have been burrowed, etc., when already cemented to form rock on the ocean floor, before being covered by new sediments), and tidal cycles in sediments. It is my purpose here to propose some modifications to traditional thinking that could lead to an improvement in our understanding of the Flood. 1. A literal creation week of seven consecutive, 24-hour days. 2. At the end of creation week, Earth contained a variety of plants and animals, including invertebrates, fish, reptiles, mammals, birds, and trees, including at least some that are considered to be the more “highly evolved” types such as humans and fruit trees (angiosperms). 3. The creation week occurred only a few thousand years ago. There are uncertainties about the completeness of genealogical lists and differences between ancient biblical manuscripts, but although we do not know the exact time span, I conclude that Scripture clearly portrays a short history of life on Earth. 4. Sometime since the creation there was a catastrophic flood of global proportions. Noah and his family and representatives of the terrestrial vertebrates survived in an ark, while the others died in the flood. 5. There may have been extensive geological activity before and after the Flood. The geologic column contains fossil and sediments produced by the Flood, and also those produced by processes acting before and after the Flood. 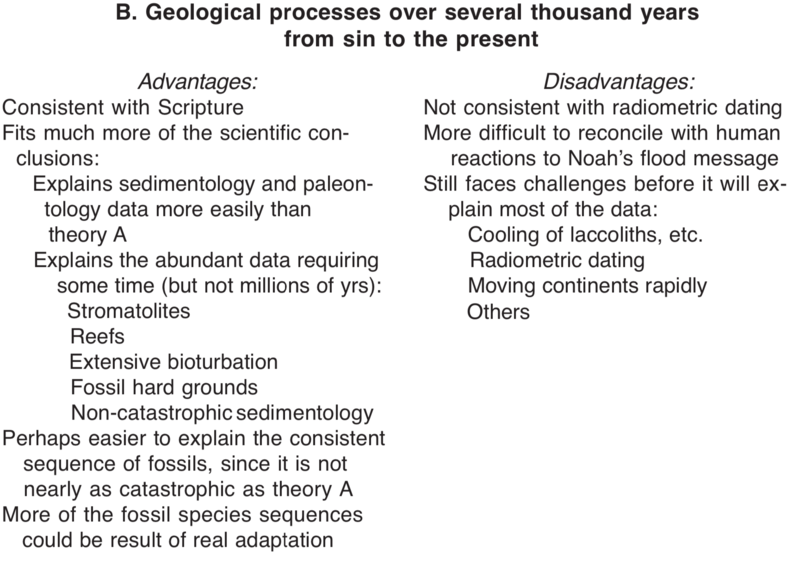 I propose this approach, incorporating point 5 above, be called “wholistic geology”, in contrast with “flood geology”, since it attempts to explain the geologic column by taking into account potential geological activity during the whole history of the earth rather than restricting it to only the Biblical year of the flood. Others have also begun to think in similar terms (Snelling 1996, Gentet 2000). At present I do not believe that we have a satisfactory understanding of how to relate the geologic record or its fossils to the biblical flood. Before we can do so there seems to be need for a better theory of what might have happened, geologically, throughout history since creation. Then we must seek ways to test our theories, and finally, practical field research to do the testing and to feed back into an improved theory of geological history. The development of theories of geological history consistent with Scripture must be based on sound geological evidence. It should involve original field research specifically designed to test concepts of the theory and find criteria for accepting or rejecting various ideas. As a starting point for developing an alternative flood theory, the following ideas are suggested elements of a theory that includes significant geological activity between creation and the flood, and after the flood. This article is not presenting a detailed theory, but suggests a different set of parameters for developing a theory. These ideas can be helpful as long as we do not become too attached to them. This is not a theory to be defended, but a suggestion of an approach to the study of geological history that could lead in time to an alternative theory, that can be fruitfully compared with more traditional geological theories. Chamberlin’s concept of multiple working hypotheses (Chamberlin 1965) is very useful, especially in the initial phases of evaluating which direction to go in our theorizing. The following points are intended as a basis for developing one of the possibilities. 1. Perhaps processes forming the Phanerozoic record began soon after sin, and continued to the present day. 2. Perhaps during the hundreds of years before Noah’s trip, a part of the geologic record formed in the ocean basins and lowland areas not inhabited by humans. This is supported by the fact that some of our modern continents are largely covered by Paleozoic marine sediments, indicating they were lowland basins before the flood (Brand 1997, p 274-276). These basins were largely occupied by shallow oceans and nearshore environments, and it is not clear where the preflood continents were. This may seem extreme, but if our present continents were originally covered by ocean, how could the people and other terrestrial plants and animals have been living there? They had to be somewhere else. The basaltic rocks forming modern ocean basins are no older than about Jurassic time, so we are not sure what occupied that area before Jurassic time. Perhaps there were some type of continents in these parts of Earth. The time available for this would be up to about 1500 years if the time span since creation was roughly 6,000 years. If the time since creation was closer to 10,000 years, the time for “preflood” geological processes could be up to 5,000 years, or the time since the flood could be longer than we have thought. 3. There was a global flood as described in Genesis. Some dramatic change took place at that time, destroying the inhabited parts of Earth, in a process involving Divine activity, very different from normal earth processes. Perhaps that dramatic change involved the breakup of part of Earth’s crust, with rapid subduction of old continental areas (ala Baumgardner? [Clausen 1998]), or loss of continental area by some other process. If this destruction of the continental areas inhabited by humans was rather complete, then it may be difficult to find or to recognize evidence for this subduction event. Is it possible that continents could be subducted into the mantle? It seems that this would require that preflood continents were different in composition from modern continents. Continents now have a foundation of granitic rock, which is too light to sink down into the denser basaltic material under them. One possibility is that at least some of the original continents were of basaltic material, but with abundant pore spaces for water movement, resulting in a net specific gravity lower than solid basaltic rock. A continent of this composition would be light enough to stay above the ocean water level, but if the water system collapsed so that it became solid basalt, it could then be subducted into the mantle. Another option to consider is that the original parts of continents occupied by upland terrestrial ecosystems, including humans, were located in parts of our continents that are now called shields. These are areas that have no rocks younger than Precambrian. Northeast Canada and a large part of Greenland compose one of these shields. Are there other possibilities that we have not thought of, that should be considered? 4. After that major crisis, the earth was again stable enough to support life, but much catastrophic action continued as crustal plates moved to their current positions and the crust gradually reached a new equilibrium. This period of readjustment after the flood produced the more recent part of the geologic record, over a time period of hundreds to perhaps a few thousands of years. 5. Portions of the fossil record, before and since the flood, may have accumulated slowly enough for evolution within lower taxonomic levels to occur, and to be recorded in the fossil record. Possible examples of this could be the series of species of trilobites in successive units of Cambrian rocks, or ammonite species in successive ammonite zones in Cretaceous sediments. This suggests that microevolution and speciation can occur within created groups much faster that most scientists believe possible, especially when environments are changing rapidly (genetic evidence may support that idea) (Brand 1997, ch 12; 2006, ch 5). One difficulty with this idea is that so often species appear in the fossil record with no intermediates linking them to ancestral species. Also we need to determine if there is a portion of the fossil record that does not have any such succession of species, and if this represents the flood. 6. The sequence in the fossil record resulted from a combination of (a) changes in the ecological zones affected at various times (a sort of stretched out version of ecological zonation. This may be more realistic than Clark’s version, since the less catastrophic processes in the wholistic geology theory might be less likely to mix organisms from very different habitats), (b) actual microevolution and speciation within created groups as organisms adapted to changes in water chemistry, temperature, plant associations, etc., (c) migration of organisms and perhaps competitive replacement of some groups, and (d) die-offs occurring as changing ecological conditions (involving episodes of volcanism, continental movements, and other events) reached successive crisis points for different groups of organisms. The theory built on the concepts listed above is called the wholistic geology theory, because it incorporates a wider range of information than other geology theories. It includes the biblical global flood, and the possibility of extensive geological action before and after that flood. All the available geologic data are utilized in developing the theory, while also gaining insights from biblical constraints. This results in suggestions for new research to test this new theory. Part of this research will be done in areas where there are unresolved conflicts between conventional geology and biblical insights, and in some cases this analysis makes predictions as to what the findings of new research will ultimately be. Figure 1. Rates of erosion, sedimentation, and other geological processes, according to three theories of earth history. A - most of Phanerozoic geologic record in a one-year flood; B - wholistic geology theory, with active geological processes beginning soon after creation and extending for several thousand years; C - geologic record formed over the conventional geologic time scale. Wholistic geology can be compared (Figure 1) with a traditional flood theory with the Paleozoic and Mesozoic formed during the flood and the conventional long ages theory. Each has advantages and disadvantages in its consistency with the scientific and biblical data (Table 1). These three theories are testable. Testing them will not happen quickly, as it will require some effort to develop better ideas of just what processes would be involved in a wholistic geology theory. But some basic aspects of the theories can be tested even now, with good field work. One definite advantage of considering new options, e.g., a wholistic geology theory, for comparison with the traditional flood theory is that we are not boxed in by unnecessary constraints. If we make the extrabiblical assumption that all fossil-bearing geological deposits began at the flood, then there are many situations where we have no choice but to interpret entire rock formations as deposited in hours, days, or a few months at most. 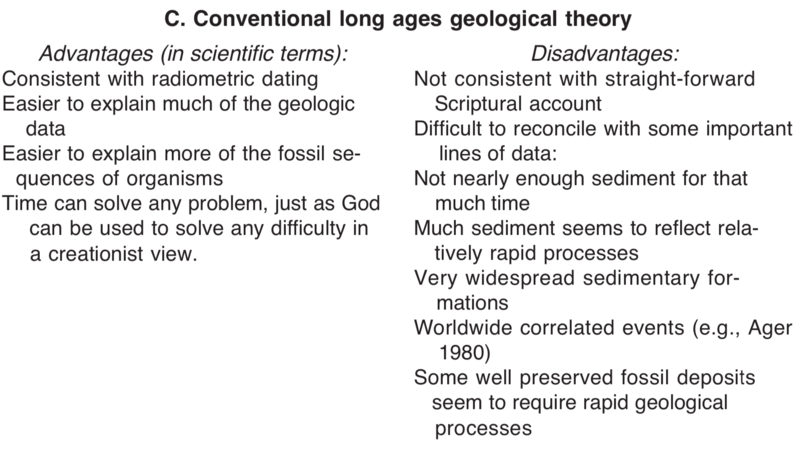 However, if we are comparing two or more theories, like the traditional flood theory and the wholistic geology theory, we can open-mindedly evaluate (while still working within a conservative biblical framework) whether each rock formation was deposited within hours-months, or whether they each took many years (years to hundreds of years) to form. Of course if we remain within a time frame of thousands, rather than millions, of years, this still requires the prediction that there are entirely new interpretations needed for some geological processes. That is true even for those who prefer a longer time frame, like a few hundred thousand years, and the data available to us from scientific study may not be able to establish whether it was <10,000 years or >100,000 years anyway (there will always be personal faith convictions involved), so I hope that all who care about the Genesis account can work together on this, no matter just what time frame we believe is best. A theory, including the one proposed here, is only useful if it encourages research that improves our understanding of the subject. A useful scientific theory will make predictions of what will be discovered if the theory is correct. If these predictions stimulate discovery through research that would likely not have been done otherwise, the theory has become a productive scientific theory. The traditional flood theory and wholistic geology theory each make predictions, many of which should be testable by field research. The following list includes examples of general predictions or conclusions, and they could be subdivided into more specific, testable, predictions. Further study will no doubt generate additional types of predictions. Radiometric dates do not indicate realtime for at least the Phanerozoic rocks. They seem to indicate relative age (which event came before which other event), but not absolute age. I do not think the challenge of radiometric dates will be answered by piecemeal explanations, different for each method, but will require some basic new discovery of a process that uniformly affects all dating methods. If Noah’s ark is ever found and is dated with carbon 14, the date will not be a few thousand years, but will indicate nearly infinite age. This is because the ark was built from pre-flood wood, which was apparently living before living things contained significant amounts of carbon 14. Most geological processes occurred relatively rapidly — much more of the geologic column was formed more rapidly than most scientists now believe. Features in the rocks interpreted as Milankovitch cycles (cyclic climatic processes controlled by solar variation, representing cycles of hundreds to tens of thousands of years each) did not result from such long cycles. They formed rapidly, from some other process. Other cyclic processes in rocks also were rapid, not occupying eons of time. Some finely laminated rock is generally interpreted as varves,which are laminations formed one per year, as occurs today in some lakes in glaciated areas. Our prediction is that these cycles of thousands of fine laminations in ancient deposits were not varves. There are other mechanisms to be discovered that will explain these finely laminated rocks. There are not many additional predictions, beyond those listed above. Stromatolites, reefs, trace fossils, dessication cracks, etc., will generally be explained by processes the same or similar to those used by conventional geologic theory. They can be explained within the time frame of the wholistic geology theory without straining the theory. There will be some part of the geologic column, formed within the one-year flood, without features requiring significant time. These features include true stromatolites, reefs (underlain by sequences of fossiliferous sediments), sediments clearly representing an in situ, established ecology, or in situ hardgrounds. Tidal cycles in the rocks, with about two lamination formed each day, will be more common in ancient rocks than now recognized. Theaveragethicknessofsedimentdepositedperyearwasacouple of meters or less. The rate may have varied, from some truly catastrophic episodes to some time periods with no net accumulation or erosion of sediment. Sequences of species or genera of organisms resulting from micro evolution during the deposition of the sediments may be found, in many, and perhaps most, parts of the fossil record. The time frame for this deposition could have been long enough for rapid microevolution and speciation to occur. The wholistic geology theory allows more time for explaining some geological and paleontological phenomena than a traditional flood theory that requires much of the record to be formed in one year. Several thousand years is three orders of magnitude more than one year, and there is a big difference in what can occur during those two different time periods. The following discussion lists several of the important types of evidence pertinent to questions of time, with some preliminary analysis (other lines of evidence are also important, but this is a beginning). Methods are needed for testing between different biblical hypotheses of geologic history. The following lines of evidence will then be utilized in proposing such tests. As Sadler (1981) pointed out, there does not seem to be nearly as much sediment in the geologic column as is expected from modern sedimentation rates. The wholistic geology theory proposed here gives an explanation for that observation. Ancient rates of sedimentation in Sadler’s graph were determined by measuring thickness of sediment between radiometrically dated units (far right side of graph in Figure 2). The wholistic geology theory proposes that radiometric processes do not give a true measure of time, at least for the Phanerozoic, and the average rates of geological processes in the past were much faster than shown in the graph in Figure 2. Figure 2. Relationship between sedimentation rates and the time span over which the measurements were taken (after Sadler 1981). A - average sedimentation rates, on a log/log scale; B - same data but with time plotted on a linear scale. If the thickness of sediment present in the geologic column is measured (average Phanerozoic sediment thickness is 1,500-2,000 m), and compared with Sadler’s graph in Figure 2, it appears that in the wholistic geology theory the existing Phanerozoic sediments could be deposited by average sedimentation rates that are not more than one order of magnitude higher than modern sedimentation processes averaged over a time period of one year (Figure 2; Table 2). This should probably be increased to up to 2 orders of magnitude faster than modern rates, because in some places the sediment is much thicker than the average of 1,500-2,000 m.
Table 2. Sample rates of sediment accumulation for different amounts of time for accumulation of the geologic column, based on the average modern rate. These are only averages, and do not imply that sedimentation was uniform through time. This is possibly realistic, and probably rather conservative, if my impression is correct that at least some (and perhaps much) of the Phanerozoic rocks were deposited by more rapid processes than we observe today. This is, however, a very preliminary way of looking at sedimentation rates. We do not really know what was happening without a comprehensive analysis of the effects over time of sediment supply, basin subsidence, and whether basins are draining (closed vs. open basins) (Carroll & Bohacs 1999) in different areas. These are also only average rates, and do not mean that processes were occurring at steady rates. There could have been episodes of rapid sedimentation and periods of little activity. There would have been times with very catastrophic processes, especially during the year of the flood proper. However, during the rest of the time average sediment accumulation rates may have been only one or a few meters per year, and that can hardly even be considered catastrophic. It seems to me, from the literature and from my own study, that some significant types of evidence in the rocks point to rates of geological processes that are much too fast for conventional theory based on the radiometric time scale. A wholistic geology theory may come closest to explaining this, since the time frame of this theory can account for the existing sediments with geological processes that are not much faster than is observed today, even in our relatively stable earth. Figure 3. Comparison of two models to explain the shortage of sediment in the geologic column. 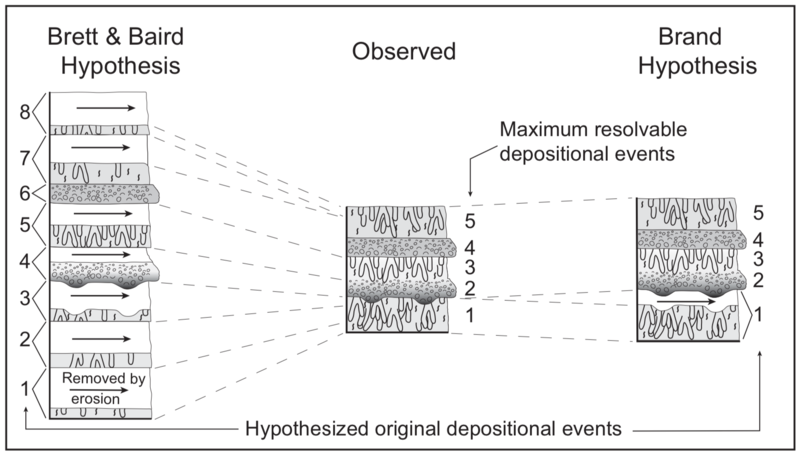 Diagrams in box portray the hypothesized original amount of sediment deposited, for each model, and (center) the observed sedimentary record. 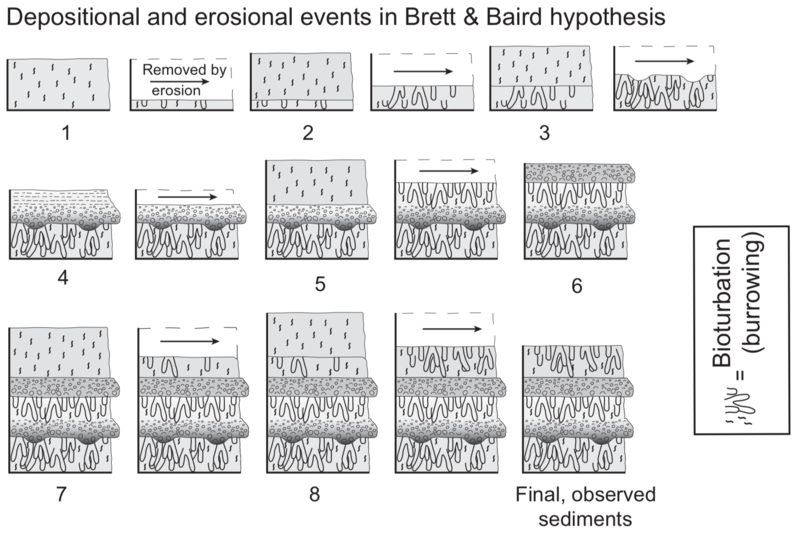 In the Brett & Baird model (diagram modified from Brett & Baird 1986) there were successive episodes of sedimentation followed by the erosion of part of the sediment before the next sedimentation event. Extensive burrowing by animals obliterated some contacts between sediment layers so that individual layers cannot be distinguished. In the Brand model no sediment erosion is assumed except where indicated by definite evidence of such. Eocene Bridger Formation, SW Wyoming — radiometric dating requires about 200,000 year cycles between limestones, while taphonomy of the abundant fossil turtles, stromatolites, sedimentological data, etc. can, I believe, be better explained in perhaps 20100 year cycles (3-4 orders of magnitude difference). Sadler’s (1981) data on rates of sedimentation indicate that ancient rates based on the radiometric time scale are 4-8 orders of magnitude slower than modern rates measured over one year (Figure 2). Brett & Baird’s (1986) theory (ad-hoc hypothesis) for explaining the missing sediment is shown in Figure 3 (Sadler 1993 proposes a similar theory). His proposal is that there were many episodes of additional sedimentation, but the extra sediment was eroded away and thus not preserved in the rocks. This additional, hypothetical, sediment does not need to be included in the theory I am proposing. We can suggest that the existing sediment is generally close to what was originally deposited, except when there is definite evidence of a significant erosional unconformity. These relatively rapid geological changes and resulting ecological change might also generate faster rates of biological change. 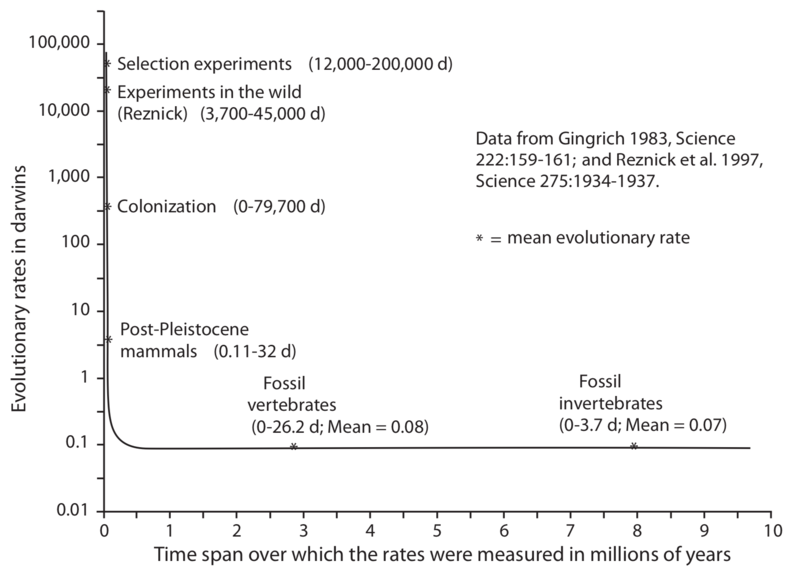 Rates of evolution observed today (microevolution and speciation) are much faster than the rates calculated from the fossil record as dated by radiometric dating methods (Figure 4), by 7-10 orders of magnitude. Acceptance of the radiometric time scale requires one to conclude that observed modern evolutionary rates do not reflect reality (e.g., Gould 1997-1998) (another ad-hoc hypothesis?). However, acceptance of the wholistic geology theory would suggest that rates of biological change in the past may have been as fast, and quite possibly much faster on the average, than the rates measured today. If Earth today is more geologically and ecologically stable than it was during much of its history (this would be true in either a traditional flood or wholistic geology theory), it is likely that rates of evolution in the past would have been faster than today (Brand 1997, ch 12; Wood 2002). In other words, perhaps the geologic and biological data are hard to reconcile with either alternative — most of the geologic record in a one year flood at one extreme, and millions of years at the other extreme. Real rates of geological and biological change may fit best with a time span of the order of magnitude that this proposed theory suggests. Figure 4. Evolutionary rates measures in modern settings and calculated from the fossil record (fossil calculations based on radiometric time scale). Evolutionary rates are measured in units called darwins. A darwin is a specific, measurable, amount of morphological change. Stromatolites, reefs, extensive bioturbation of some sediments, fossil hard grounds, and other features of biological origin seem to require some time, but not millions of years. Stromatolites (Cooper et al. 1990, p 229, 233) and reefs (James 1983, Kiessling et al. 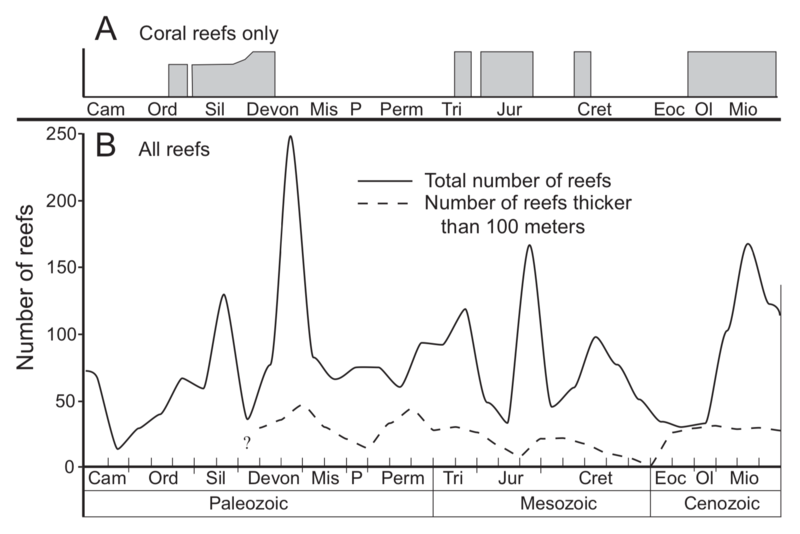 1999) seem to be distributed throughout the fossil record (Figure 5), and this seems impossible to explain in a one-year flood (because each stratigraphic level of reefs, if the reefs formed in situ, would require several years to hundreds of years to grow). More study is needed, but it seems likely that these features can be more readily explained in the time frame of the wholistic geology theory. Figure 5. Distribution of reefs in the Phanerozoic fossil record. Data from James 1983, and Kiessling et al. 1999. Separate from the question of whether a carbonate structure is a wave-resistant reef, is the time required to form extensive amounts of carbonate sediment that formed in situ, containing unsorted organic remains that do not appear to be transported assemblages. Ancient reefs (and other carbonate accumulations) are usually much smaller than our biggest modern reefs (e.g., those in the Pacific Ocean), and any that did form in situ would require some time, but perhaps they could develop in a short time frame. This needs much more study. To evaluate the time required to form deposits generally interpreted as evaporites (accumulations of salts from evaporation of large volumes of water) requires that we know what was the actual mechanism that formed them. A geologic record forming in a few thousand years could explain some evaporites, but still predicts that the processes that formed some of these deposits (e.g., the thick sequence of laminated evaporites in the Permian Castille Fm.) are not yet adequately understood. There are still aspects of these processes that are hard to understand within even a wholistic geology theory. Sediments with tidal cycles (one lamina deposited with each high tide) may represent a time frame consistent with the theory suggested here. Discovery of these tidal cycles has changed the interpreted time for deposition of some rocks from thousands or millions of years, to a few years (e.g., Archer & Kvale 1989, Archer et al. 1995, Brown et al. 1990). This is still a challenge to a traditional flood theory, but fits well into a wholistic geology theory. Finely laminated sediments usually interpreted as varves (one layer formed per year) need more study, as this theory predicts that extensive deposits of many thousands or tens of thousands of “varves” do not represent actual annual deposits. In some cases there is already evidence that challenges the varve interpretation. For example, some deposits commonly interpreted as varves contain very abundant fossils that are exquisitely preserved (e.g., the Eocene Green River Formation). There does not seem to be an adequate explanation for how these fossils could be so well preserved unless they were buried rapidly (see below, under taphonomy). Sedimentary cycles are characteristic of much of the geologic record. These cycles (e.g., successive packages of sediment with repeating features usually interpreted as cycles of raising and lowering sea level over many thousands of years per cycle) are very numerous in some formations. To evaluate the time implications requires that we understand the mechanisms behind these cycles. Some may be actual cycles of water level change, but other mechanisms should also be considered, including possible mechanisms not yet discovered. Turbidites were once thought to represent cycles of several years each, but are now known to form in minutes from underwater mudslides. Perhaps there are cyclic processes yet to be discovered that are quite different from turbidites, but are as undiscovered as turbidites were prior to the 1950s. The field of taphonomy (study of the processes from death to fossilization) is producing much fascinating data. Research has shown how important rapid burial is for producing fossils, especially for well-preserved vertebrate fossils. It appears that the implications of this have not been fully explored. Many formations with superbly preserved vertebrates in large numbers (e.g., Green River Fm. fish etc., Bridger Fm. turtles, ancient diatomites with well-preserved whales and other vertebrates [Esperante-Caamano et al. 2002, Brand et al. 2004]) are often interpreted as accumulating very slowly, perhaps centimeters/thousand years with the fossils escaping decay because they are in anoxic water (no oxygen). However, experiments have refuted the hypothesis that anoxic water slows or eliminates decay. Decay is not slower in anoxic conditions, it just involves anaerobic bacteria (Plotnick 1986, Allison & Briggs 1991, Allison et al. 1991). These well-preserved fossils seem to require very rapid sediment deposition. The other side of the taphonomy data needs to be also thought about. If at least the Paleozoic and Mesozoic were deposited within a year, with systematic ecological processes killing and burying organisms, then most animals must have been buried very soon after death — within hours or days. The problem with such consistently rapid burial is that it should have preserved mostly intact, articulated specimens. However, the vertebrate fossil record (with definite exceptions, as mentioned above) consists mostly of disarticulated, scattered bones and teeth. Most of these disarticulated remains probably required several weeks or months of decay and disarticulation before burial. Is it possible to fit that many episodes (dozens or hundreds of episodes) of several months of disarticulation into a one-year Cambrian to Cretaceous process? However, if many animals were not buried quickly after their death, how could animals from different ecological zones have been killed and buried in the precise sequence that we see in the fossil record, without mixing up animals from different zones? This is a puzzle for any short age geology theory. Some flood theories require that many or most organisms be transported up to thousands of kilometers to the areas where they were buried and fossilized. This concept introduces problems in explaining some fossil deposits. The wholistic geology theory may not require as much long distance transport, but this needs much more study. It seems doubtful that we can or even should try, to use science to disprove conventional geology theory and the evolution of life (in study of the ancient past, proof or disproof is especially unlikely). Rather, our task is to develop alternate explanations for the evidence. That is always a first step for any scientific theory. These theories are unique in having been launched from a platform of faith, but if our faith is based on truth, it will point us in the right general direction. Our search for truth may at times follow a winding path as we test and refine or reject various ideas, but it will in time lead us to more satisfactory explanations for the data. As we search, the farther we get in developing a theory that is able to suggest constructive new research to be done, the more it will have promise of making real progress. What is the reason for thinking this is important? Some of us believe that Biblical revelation is reliable, even on the topic of the origin and history of life on Earth. We would be missing something if we fail to utilize these insights to steer us in productive directions in research. I believe several things are needed at this time to make our flood theorizing efforts productive. A concerted research effort is needed to raise our prospects of success. In recent decades geology has improved its understanding of many processes, and this improved understanding is helpful to us also. And yet there are still many areas where a faith-based theory predicts that new, even radically different, processes are yet to be discovered. If we would do justice to this work, the research must be done with impeccable care and scientific rigor, benefiting whenever possible by the quality control of peer review. Continue, and expand, the types of current or recent research, on specific rock formations such as the Pisco Formation in Peru, the Yellowstone fossil forests, Bridger Formation and Green River Formation in Wyoming, or specific phenomena like paleocurrents. Learn more about geology in other parts of the world. We often base much of our thinking on North American geology. This is a good start, but knowing more about other places will also be helpful. For example, in at least part of the Middle East the Paleozoic is represented by one continuous sandstone which was originally of immense size (Burke 2000). Above that is Cretaceous limestone, and then the Pleistocene Lisan Formation in the Dead Sea rift valley. What can this sequence, so different from the rocks in North America tell us? Concerted study of phenomena that appear to be “constraints” on the amount of needed time — phenomena that require a considerable amount of time. Examples of these (discussed in more detail below) are the reefs, stromatolites, taphonomic processes like degree of disarticulation and preservation, etc., and what they tell us about time for growth, death and burial. Ultimately these questions should be answerable, if we take our faith-based insights seriously, so we do not need to avoid these challenges. Part of the research on the above mentioned “constraint” phenomena should be asking if they are really constraints, or just clues to the existence of undiscovered processes. Learn more in general about all parts of the geologic column, and the geographical and stratigraphical distribution of features that do seem to remain as genuine constraints. Quantitative comparison of ancient rock formations with equivalent modern analogues. Some ancient formations seem to be of a size scale (individual formations covering over 250 km2) or character (differences between modern and fossil sand dune fields) that is very different from any modern analogues, and some features seem to imply a faster rate of accumulation than occurs today, or than the radiometric time scale suggests. Careful documentation of these formations and analogues, including quantitative comparisons, would allow more realistic evaluation of how similar or different ancient geological processes were from modern processes. Increased study of changes within various groups of organisms through geologic time, and the sequences of changing forms. Use improved methods to evaluate which types of changes seem to represent actual evolution within created groups of animals and plants (e.g., Scherer 1993, Wood 2002, Wood & Murray 2003). For example, is the sequence of fossil horses an actual postflood evolutionary sequence? Field study of specific locations, applying our theories to one basin at a time. Study stratigraphic sections through the deposits in the basin, and also lateral variations in the sediments and fossils. This type of field work has promise to greatly improve our efforts to understand flood processes. This research effort would benefit from a managed science approach, in which research funding is available for research directed to the specific goals of the project. Eocene deposits in the Green River Basin of southwestern Wyoming include the Green River Fm. and the Bridger Fm. The Green River Fm. (GRF) was deposited in ancient Lake Gosiute, and the lower part of the Bridger Fm. represents the flood plain along the edges of the lake. In the concluding phase of the formation of Lake Gosiute, as usually recognized, increasing volcanic episodes from the north began to fill the lake periodically with thick packages of volcaniclastic sediment which was partly redistributed by fluvial (flowing water) processes. This fluvial deposition formed most of the Bridger Fm., which extends across a significant part of the basin. The Bridger Fm. also contains a series of limestone units, representing basin-wide lakes which existed between episodes of volcanic deposition (Brand et al. 2000, Brand 2007). Radiometric dates for the GRF and Bridger give a total time span of about 15 million years (Murphey 2001, Smith et al. 2003). The GRF contains tens of thousands of thin laminations (~ 1/10 mm thick) that are often interpreted as varves, understood as one lamination per year. The Bridger Fm. is interpreted as flood plain deposits from rivers, ponds, marshes, and periodic lakes formed over extensive time periods. The abundant turtles are assumed to have lived in the ponds and marshes, and to have died in large numbers as individual water bodies dried up. However, several lines of evidence suggest that these long time spans may not be correct. The “varved” deposits in the GRF contain millions of exquisitely preserved fossils. They are mostly fish, but there are also crocodiles, turtles, bats, palm fronds, cattails, insects, insect larvae, and a horse. The vertebrate fossils are typically complete, with bones articulated and well preserved, and the insects and plants are complete with fine details preserved. Even the abundant vertebrate coprolites (fossil dung) are well preserved and 3-dimensional, probably from rapid mineralization initiated by bacterial decay. Such excellent preservation speaks of rapid burial and fossilization. The traditional explanation was death and preservation in a deep, cold lake with anoxic water that prevented decay. But there is evidence that the lake was not very deep (Eugster & Surdam 1973, Surdam & Stanley 1979). Parts of the lake could have still been anoxic, but experiments have shown that anoxic water does not prevent decay or even significantly slow it down (Plotnick 1986, Allison 1988, Allison & Briggs 1991, Briggs & Kear 1994). Also, a study in a GRF site that was in shallow water at the edge of the lake has the same exquisitely preserved small fish, insects, and insect larvae, preserved in the same laminated sediments (Biaggi 2001). The shallow water conditions at this site eliminate the possibility of anoxic water, and the organisms must have been buried in days, not years. Also, the complete horse skeleton and large animals like crocodiles require rapid burial to account for their preservation. In some places there are soft-sediment deformation features in which the laminated GRF was distorted vertically by many meters because of the weight of the overlying sediment. If the laminations represent one layer per year, then the sediment remained soft and un-cemented for millions of years, which seems very unlikely. In the Bridger Fm., Unit B, most turtles consist of complete or nearly complete shells, almost no skulls, and few limbs. The turtles are not spread vertically through the formation, but occur in several distinct horizons. Each turtle horizon (with up to several hundred turtles per hectare) was a mass mortality event all across the basin, and field and experimental study of turtles (Brand et al. 2000, 2003) indicate the turtles were buried within a few months after their death. Each turtle bed consists of many turtles concentrated in the first few meters of mudstone above a limestone. Above that the turtles do not become more decayed and disarticulated, as we might expect if conditions changed from a mass mortality to more normal conditions. Instead, there are no turtles or extremely few turtles for the next 20-40 vertical m above that, until the next limestone. Most turtle deaths were not from slow dehydration as local ponds dried up, but from catastrophic death all across the basin of several hundred square miles, at the beginning of an episode of volcanism (Brand 2007). The sediment above the turtle layers indicates conditions suitable for turtles, so why are there almost no turtles in the sediment above these mass mortality layers, if there was an average of 200,000 years between limestone-producing lakes? It appears more likely that there was not sufficient time between deposition of successive limestones for turtle populations to build up and produce fossils. Also, the sediment is not of a type that would require thousands or millions of years for its deposition, but could probably accumulate rapidly if there was a sufficient sediment supply and supply of flowing water to distribute it. This does not prove that the GRF and the Bridger Fm. were rapidly deposited, but the evidence cited here is difficult to explain if at least significant portions of each formation were not formed rapidly. The evidence is not compatible with the geological processes usually assumed to have produced each formation. Looking at the other side of this issue, could these formations have been deposited in a few days or weeks, as would be required if they and all the rock formations older than them were deposited in a one-year flood? Several lines of evidence do not seem compatible with that interpretation, but seem to require at least several hundred years for the GRF to form. For example, the fossils and sedimentary features in the GRF are distributed in a way that indicates an established lake ecology persisting over a significant amount of time. In the middle of the lake are large fish, and the edge of the lake contains fish fry, cattails, stromatolites, etc., as would be expected in normal living conditions. Fossil burrows of bottomdwelling animals are abundant in the sediments near the edge of the lake, but not in the middle of the lake. The nature and distribution of stromatolites is consistent with a lake that periodically expands and then shrinks, from changing water levels, with the stromatolites growing only along the shore. This occurs repeatedly at successive intervals, each stromatolite bed several meters above the previous one. The Bridger Fm. also contains features that are consistent with a time span of perhaps a few hundred years, but not a one-year flood. The turtles in each turtle layer show evidence of several months between death and burial, because of the amount of decay and disarticulation of their skeletons. Also there are a number of stratigraphic intervals in the Bridger with abundant tufa or stromatolites, including some intervals with tufa growing on turtle shells. The turtles had time to partially disarticulate, and then tufa formed on the shells by chemical precipitation before they were buried. This would not require long ages of time, but more than a few days or weeks. The evidence discussed above, and other features of these formations, seems most consistent with a time frame of perhaps hundreds of years, rather than either of the extremes of millions of years on one hand, or a few weeks at the other extreme. Radiometric dates are the principal reason why they are interpreted as involving millions of years, but this is hard to reconcile with other lines of evidence. Attempts to explain them as part of the one-year flood seem to arise strictly from a particular religious but extra-biblical philosophical position on Earth history. Along the coast of Peru is a sequence of marine sedimentary formations and fossils, from at least Eocene to Pliocene. The Pisco Formation is part of this sequence, beginning in the Miocene and extending into the Pliocene. The accepted interpretation of the Pisco Formation involves about 5 million years for the accumulation of its sandstone and diatomaceous sediments and fossils. This scenario would indicate an average sediment accumulation rate of a few centimeters per thousand years. The Pisco Fm. contains abundant marine vertebrate fossils, including whales, porpoises, seals, ground sloths (interpreted as semi-aquatic), penguins and other marine birds, turtles, bony fish and sharks. These are typically extremely well preserved, with skeletons articulated or in some cases partly disarticulated but with the bones still closely associated and well preserved. The bones show almost none of the destructive effects of chemical corrosion or burrowing by organisms that occurs quite rapidly in the modern marine environment (Allison et al. 1991, Esperante et al. 2002). The fossil evidence requires burial of each animal within weeks or months at most (Brand et al. 2004). Also, where the sediment is well exposed there is often evidence that its deposition occurred rapidly from storms or tidal currents, not compatible with slow deposition of a few centimeters per thousand years. On the other hand, the Pisco Fm. contains evidence that requires more time than is consistent with its accumulating in a few days or weeks. The vertebrates were buried rapidly, but a number of them show evidence of at least several months of decay before burial. Many of the whales are buried in sediment that is mostly diatom skeletons. There is evidence that the diatoms multiplied rapidly in tremendous blooms offshore, and were concentrated, along with the whales, by storms and tidal currents that transported them into shallow bays where the whales sank and were buried (Brand et al. 2004). In spite of the unusual blooms and the concentrating currents it would take some time to produce such a large volume of diatomaceous sediment. Also there are horizons with features requiring some time for their formation. These include large colonies of small marine tube worms, up to at least two meters across and a meter thick. Such a colony forms from many generations of these very small worms building their calcareous tubes on top of the previous generation of tubes. Some smaller colonies occur on rocks that also have attached oysters and barnacles. These required time for the organisms to grow on the hard rock surfaces on the ocean bottom before burial. These same intervals have layers of phosphate nodules, which require time to form on the ocean bottom. They are accompanied also by abundant flat-pebble conglomerates formed of layers of sediment, approximately a half centimeter thick, that were abundantly burrowed by bottom-dwelling invertebrates. These pieces of burrowed sediment were ripped up by the current and transported, with their edges rounded during the transport process. The vertebrates in the Pisco Fm. show changes in size and morphological features as one goes upward in the formation. These changes indicate either some type of sorting action during the deposition process, or rapid microevolution and speciation during the time required for its accumulation, or perhaps movement during climatic changes. The primary reason why the Pisco Fm. is believed to require millions of years is radiometric dating. The sediments and fossils have features that are difficult to reconcile with this long time period. On the other hand, they also contain features that don’t seem to fit a time frame of days or weeks. Perhaps a few hundred years would be a more realistic time period for the Pisco Fm. My personal philosophy regarding the attempt to reconcile ancient history with Scripture is that it is not wise to change one’s position too readily. If a given theory of geology, e.g., is based on and consistent with Scripture but we do not know how to fit it with the scientific data, that may just reflect the lack of adequate knowledge of ancient processes and especially of how those processes may differ from our modern analogues. This is even more relevant if we have reason to think that ancient processes (e.g., global catastrophe) were quite different from anything we have ever observed. On the other hand, if this impasse does not seem to ease up with more study, and perhaps gets worse, it may be necessary to decide there is something important missing in our theory. There are those who have done that, and have decided that we need to reinterpret Scripture to fit science as understood by the majority of scientists today. I understand their reasons for doing so, but believe there is reason for some of us to try a different approach — seeking a geologic theory consistent with a more literal understanding of Scripture that includes the global flood. I believe God knows much more about earth history than we do, and has shown a level of interest in communicating with us that is not consistent with an allegorizing of Genesis. Many puzzling questions remain. For example there were mass extinctions in both the Paleozoic and the Mesozoic. Can any of those fit into a pre-flood scenario? Can they be adequately explained by the hypothesis that these extinctions affected only oceanic environments while mammals, birds, angiosperms etc. were living on the continents, in upland areas? Other questions like these beg for answers. However, unanswered questions are not unique to wholistic geology, but exist in all geologic theories. Wholistic geology is the hypothesis that a literal one-week creation, literal global flood, short age geology theory does not require that all or most of the geologic column be placed within the one-year of the flood. This opens up other possibilities that should be carefully and prayerfully pursued and tested by comparison with the data. Even this concept will require extensive research and consideration of new ways of explaining some phenomena, different from already understood geological processes. This wholistic geology theory should be studied, not assumed to be correct, but also not rejected out of hand because it is different from what we have believed. The basic ideas presented here are not new with me, but have come from discussions and time in geology field work with various persons, representing varying philosophical perspectives, who may or may not wish to have their names associated with this topic. Most important, I am thankful that God cares enough to give us guidance to help us find our way through the challenges that some scientific interpretations present to Scripture. Ager DV. 1980. The Nature of the Stratigraphical Record. NY: John Wiley. Allison PA. 1988. The role of anoxia in the decay and mineralization of proteinaceousmacro-fossils. Paleobiology 14:139-154. Allison PA, Briggs DE. 1991. Taphonomy of nonmineralized tissues. In: Taphonomy: Releasing the Data Locked in the Fossil Record, p 25-70. NY: Plenum Press. Allison PA, Smith CR, Kukert H, Deming JW, Bennet BA. 1991. Deep-water taphonomy of vertebrate carcasses: a whale skeleton in the bathyal Santa Catalina Basin. Paleobiology 17:78-89. Archer AW, Kvale EP. 1989. Seasonal and yearly cycles within tidally laminated sediments: an example from the Pennsylvanian of Indiana, U.S.A. Illinois Basin Studies 1:45-56. Archer AW, Kuecher GJ, Kvale EP. 1995. The role of tidal-velocity asymmetries in the deposition of silty tidal rhythmites (Carboniferous, eastern interior coal basin, U.S.A.). Journal of Sedimentary Research A65:408-416. Biaggi RE. 2001. Paleoecology, taphonomy and paleoenvironments of a unique littoral ecosystem within the Eocene Green River Formation of Wyoming. Ph.D. Dissertation, Loma Linda University. Brand L. 1997. Faith, Reason, and Earth History: A Paradigm of Earth and Biological Origins by Intelligent Design. Berrien Springs, MI: Andrews University Press. Brand L. 2006. Beginnings: Are Science and Scripture Partners in the Search for Origins? Nampa, ID: Pacific Press Publishing Association. Brand L. 2007. Lacustrine deposition in the Bridger Formation: Lake Gosiute extended! The Rocky Mountain Geologist 44:69-77. Brand LR, Goodwin HT, Ambrose PG, Buchheim HP. 2000. Taphonomy of turtles in the Middle Eocene Bridger Formation, SW Wyoming. Palaeogeography, Palaeoclimatology, Palaeoecology 162:171-189. Brand LR, Esperante R, Chadwick A, Poma O, Alomia M. 2004. Fossil whale preservation implies high diatom accumulation rate in the Miocene-Pliocene Pisco Formation of Peru. Geology 32:165-168. Brett CE, Baird GC. 1986. Comparative taphonomy: a key to paleoenvironmental interpretation based on fossil preservation. Palaios 1:207-227. Briggs DEG, Kear AJ. 1994. Decay and mineralization of shrimps. Palaios 9:431-456. Brown MA, Archer AW, Kvale EP. 1990. Neap-spring tidal cyclicity in laminated carbonate channel-fill deposits and its implications: Salem. Limestone (Miss. ), south-central Indiana, U.S.A. Journal of Sedimentary Petrology 60:152-159. Burke K. 2000. Deposition of imense Cambro-Ordovician sandstone bodies, now exposed mainly in N. Africa and Arabia, during the aftermath of the final assembly of Gondwana. Geological Society of America, Annual meeting, November, 2000, Abstracts with Programs 32(7):A-249. Carroll AR, Bohacs KM. 1999. Stratigraphic classification of ancient lakes: balancing tectonic and climatic controls. Geology 27:99-102. Chamberlin TC. 1965. The method of multiple working hypotheses. Science 148:754-759. Clark HW. 1946. The New Diluvialism. Angwin, CA: Science Publications. Clausen B. 1998. Baumgardner’s theorying of rapid plate tectonic motion. Geoscience Reports 26:9-10. Geology. 2nd ed. Columbus, OH: Merrill Publishing Company. Esperante-Caamano R, Brand L, Chadwick A, Poma O. 2002. Taphonomy of fossil whales in the diatomaceous sediments of the Miocene/Pliocene Pisco Formation, Peru. In: De Renzi M, Alonso M, Belinchon M, Penalver E, Montoya P, Marquez-Aliaga A, editors. Current Topics on Taphonomy and Fossilization, p 337-343. International Conference Taphos 2002. 3rd Meeting on Taphonomy and Fossilization, Valencia, Spain. Eugster HP, Surdam RC. 1973. Depositional environment of the Green River Formation of Wyoming: a preliminary report. Geological Society of America Bulletin 84:1115-1120. Gentet RE. 2000. The CCC Model and its geologic implications. Creation Research Society Quarterly 37:10-21. Gingrich PD. 1983. Rates of evolution: effects of time and temporal scaling. Science 222:159-161. Gould SJ. 1997-1998. The paradox of the visibly irrelevant. Natural History 106 (11):12-18, 60-66. James NP. 1983. Reef environment. In: Scholle PA, Bebout DG, Moore CH. Carbonate Depositional Environments, p 345-440. American Association of Petroleum Geologists Memoir 33. Kiessling W, Flugel E, Golonka J. 1999. Paleoreef maps: evaluation of a comprehensive database on Phanerozoic reefs. American Association of Petroleum Geologists Bulletin 83:1552-1587. Murphey PC. 2001. Stratigraphy, fossil distribution, and depositional environments of the Upper Bridger Formation (Middle Eocene) of southwestern Wyoming, and the taphonomy of an unusual Bridger microfossil assemblage. Ph.D. dissertation, University of Colorado. 345 p.
Numbers R. 1992. The Creationists. NY: A. A. Knopf. Numbers R. 1999. Darwinism, creationism, and intelligent design. In: Kelley PH, Bryan JR, Hansen TA (eds.). The evolution-creation controversy II: perspectives on science, religion, and geological education, p 83-103. The Paleontological Society Papers 5. Plotnick RE. 1986. Taphonomy of a modern shrimp: implications for the Arthropod fossil record. Palaios 1:286-293. Reznick DN, Shaw FH, Rodd FH, and R. G. Shaw. 1997. Evaluation of the rate of evolution in natural populations of guppies (Poecilia reticulata). Science 275:1934-1937. Sadler PM. 1981. Sediment accumulation rates and the completeness of stratigraphic sections. Journal of Geology 89:569-584.
approaches to time resolution in fossil assemblages, p 188-209. Short Courses in Paleontology 6. The Paleontological Society. River Formation, Wyoming. Geological Society of America Bulletin 115:549-565. Snelling AA. 1996. Special symposium: Where should we place the flood/postflood boundary in the geological record? Creation ex Nihilo Technical Journal 10(1):29-31 (introduction to several papers on this topic in the same journal issue). Surdam RC, Stanley KO. 1979. Lacustrine sedimentation during the culminating phase of Eocene Lake Gosiute, Wyoming (Green River Formation). Geological Society of America Bulletin, part I, 90:93-110. Whitcomb JC, Jr., Morris HM. 1961. The Genesis Flood. Philadelphia: The Presbyterian and Reformed Publishing Co.
Wood TC. 2002. The AGE-ing process: rapid post-flood intrabaraminic diversification caused by altruistic genetic elements (AGEs). Origins 54:5-34. Wood TC, Murray MJ. 2003. Understanding the Pattern of Life. Nashville, TN: Broadman and Holman, Publishers. There is significant scientific data consistent with the biblical record of history, EZT represents one scientific theory that seems to explain historical data from the Bible and data from paleontology thought to challenge the Biblical record. Researchers discuss the role and position of Neanderthals in an alleged evolutionary process and debate whether they went extinct before, during or after anatomically modern humans colonized the northern hemisphere, and if the former interbred with the latter. However, many recent studies, ranging from genetics to the analysis of Neanderthal technology and culture suggest that Neanderthals might be understood within a different scientific framework. Recent discoveries have shown artistic behaviors in Neanderthals including decoration of their bodies with jewelry and probably pigment. Moreover, these are clear indicators that they made use of language and verbal communication.